Leaving behind a summer full of solidarity action in the streets of London, let’s roll up our sleeves for Autumn solidarity for Julian Assange. 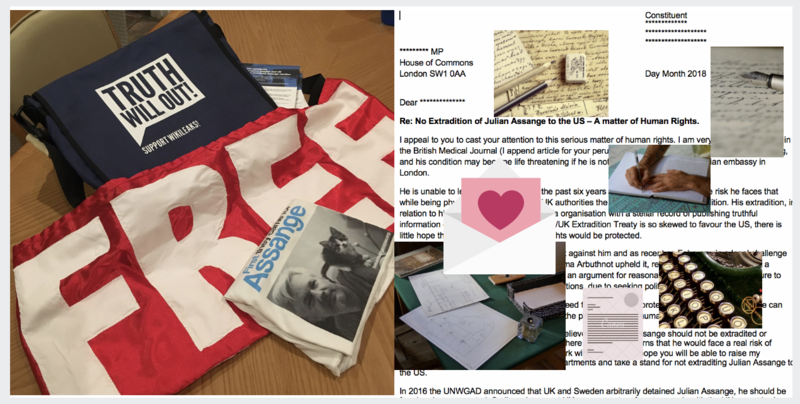 Take this step with us utilising the right and privilege, open to us in democratic societies, to approach our Members of Parliament in the UK with a request to intervene asking that our government provide guarantees of non Extradition to the USA for Julian Assange, the Editor of WikiLeaks. Why should an uncharged man be detained by the UK for so long, isolated with his health deteriorating. Julian Assange is an Australian and Ecuadorian citizen, but does he have the rights of any other resident in the UK? Does he have a member of Parliament to represent him in UK parliament like all the other people who reside in the UK? Certainly no MP has seemed to have taken up his cause or acknowledge Julian Assange as a Constituent. Yet, one million Commonwealth migrants can vote in the UK despite not having British citizenship. All these are interesting questions we are not in a position to answer, but what we can do is do the writing ourselves. Re: No Extradition of Julian Assange to the US – A matter of Human Rights. I appeal to you to cast your attention to this serious matter of human rights. I am very concerned to read in the British Medical Journal (I append article for your perusal) that Julian Assange’s health is deteriorating, and his condition may become life threatening if he is not released from the Ecuadorian embassy in London. He is unable to leave the embassy for the past six years and three months due to the risk he faces that while being physically detained by the UK authorities the US would ask for his extradition. His extradition, in relation to his work with WikiLeaks a media organisation with a stellar record of publishing truthful information over the last 12 years. The US/UK Extradition Treaty is so skewed to favour the US, there is little hope that Julian Assange’s human rights would be protected. I recognise that there is a valid arrest warrant against him and as recent as February, in a legal challenge at Westminster Magistrates Court Judge Emma Arbuthnot upheld it, re-iterating that: ‘once at court a defendant will be given the opportunity to put an argument for reasonable cause’ regarding his failure to surrender to court, according to his bail conditions, due to seeking political asylum at the embassy. The UK should recognise Julian Assange’s need for international protection vis-à-vis the USA so he can appear in the British Court without foregoing the protection of his human rights. Recently I read that “Amnesty International believes that Julian Assange should not be extradited or subjected to any other transfer to the USA, where there are concerns that he would face a real risk of serious human rights violations due to his work with Wikileaks.” I hope you will be able to raise my concerns to the appropriate government departments and take a stand for not extraditing Julian Assange to the US. Upholding Human Rights is the only compass for ensuring our laws and traditions, do not become a mockery of justice. When your MP answers your letter please send us his/her reply to JADC@protonmail.ch and we shall publish it here (your personal details will not be published). 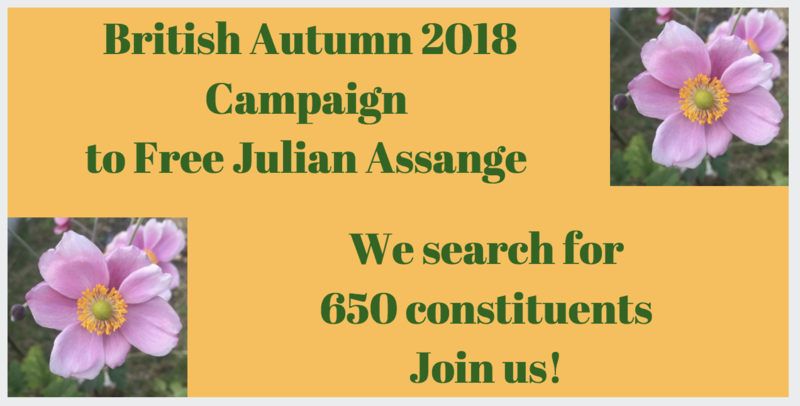 We have a whole Autumn and Winter to get busy to cover the whole of Britain, join this worthy effort in campaigning for Julian Assange’s freedom. This entry was posted in Assange, WikiLeaks and tagged Julian Assange, Letter Writing, WikiLeaks. Bookmark the permalink.